As I shared with you all last week, I've gone out of my way to create as much video as possible over the past year, as a way to make myself feel more at home in front of the camera. But given that I'm a marketer who works from home without access to super fancy video equipment, I've tested Vidyard GoVideo and Wistia Soapbox extensively to whip up short messages and video presentations for fellow colleagues, our audience, clients, and IMPACT partners. Well, both are Google Chrome extensions that connect to your webcam and computer microphone, enabling you to create talking head videos and screenshares that you can embed in site pages and emails with ease. But after many months of experimenting with both, I've given my final rose to Vidyard GoVideo. Should you do the same? Well, not so fast -- there are some key differences between the two platforms you should be aware of, before you make the decision for yourself to go steady with either Vidyard GoVideo or Wistia Soapbox for video for marketing or video for sales. Vidyard GoVideo is simple and totally 100% free. 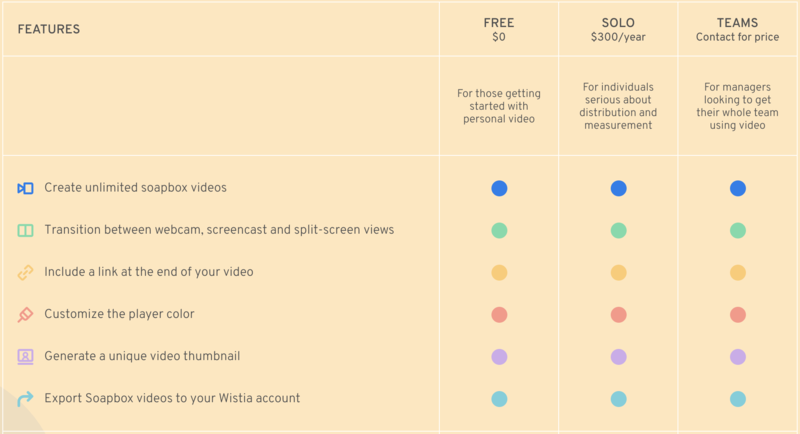 Wistia Soapbox gives you a lot of functionality for free, but most of the "fun" stuff you can do requires you to pony up some dollars and cents. The fact that you need to pay as you scale-up your use of Wistia Soapbox isn't necessarily a negative; in a lot of ways the Soapbox product is much more robust than GoVideo. Note: If you have a Vidyard pro account that's connected to your GoVideo instance, you can download your GoVideos and set your GoVideos up to appear on a branded landing page with your company logo, which is a nice perk. There's my face! I love that, because it makes my messages and presentations more human and personal. Whereas with Soapbox, if you put yourself in presentation mode, that's all someone will see on the screen as they're watching your video. And, as shown above, you can also trim a video down, after it's been recorded. While you can pause, stop, or start recordings over in GoVideo, this type of editing is not available. Moreover, once you commit to a type of video (talking head vs. presentation mode) before you hit record, that's what you're stuck with for the entire duration of the video. And you certainly can't edit your video to use multiple presentation styles after the fact. In fact, you can't edit a GoVideo at all, once you've finished it. Also, unlike the full version of Vidyard -- or premium tiers of Wistia Soapbox -- you can't add calls-to-action to your GoVideos, or provide the ability for viewers to book meetings, customize the color of the player, etc. 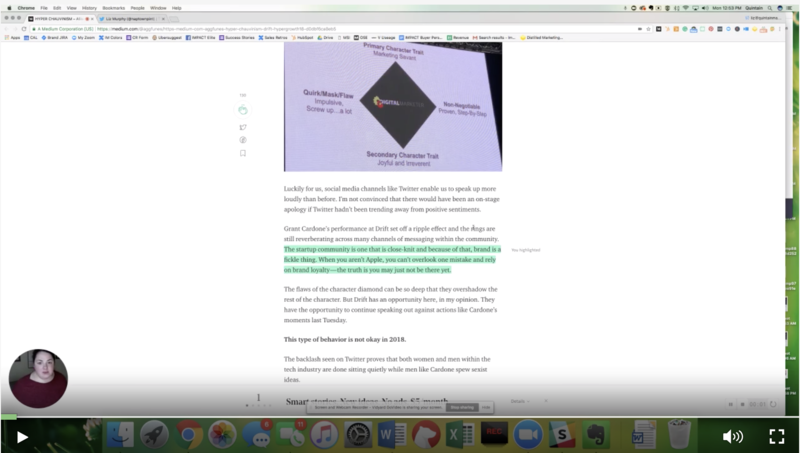 Well, actually, you can embed a text-based CTA at the end of a video in the free version of Wistia Soapbox, which some might consider a huge advantage over GoVideo. This goes a massive step beyond the standard "upload custom thumbnail" option available on both platforms. Actually, there are quite a few Vidyard GoVideo use cases for marketing. In addition to the animated thumbnail, the fact that I can get the statistics for my video for free, instead of having to pay for data with Wistia Soapbox, is a major plus. Now, it should be noted that yes, Soapbox makes you pay for analytics, but the analytics you get are more in-depth -- for instance, you don't just get the number of views, but also viewer retention, etc. That said, I can access that level of detail if I create a full account at Vidyard.com that's connected to the account I use to create GoVideos. Without context, it might be easier to say that Wistia Soapbox provides more options, and thus is a better choice. For some that may be true, if you want to get more hands-on with the editing and reporting functionality of your spontaneous videos -- or if you want Soapbox to take the place of a subscription of a larger video hosting service. For me, GoVideo is an application that complements the full-scale access to standard Vidyard hosting -- which has a lot of the analytics and other features missing from GoVideo -- we already have as an organization. So, I don't need it to be everything, because it's something I use for a very specific context. Additionally, I'm a big fan of the fact that HubSpot Video is powered by Vidyard, which makes me more inclined to hitch my wagon to this horse, so to speak. Bottom line, I've only got good news for you. They're both intuitive, and easy to pick-up quickly and use, without formal training. That means all you need to do is decide what it is you actually need. Do you need a quick video application that can or needs to complement a full suite of business video hosting? Vidyard GoVideo would be my recommendation. Or, do you need something more comprehensive, with lots of features, that can potentially stand on its own and take the place of full-scale video hosting? Well, in that case, Wistia Soapbox might be the right move. So, ask yourself what you really need first. Then you can make your choice on which solution is the best one for your situation.